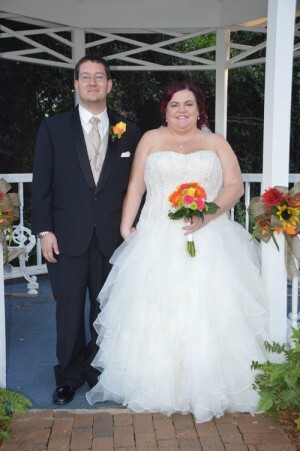 Elizabeth Marie Snyder of Chester, South Carolina and Kevin Allen O’Neal of Patrick, South Carolina were united in marriage at Wedding Chapel by the Sea in Myrtle Beach, South Carolina on October 31, 2014. The bride is the daughter of Charlie and Vicky Snyder. She is the granddaughter of TJ and Rita Snyder and the late Mary Snyder. Also the late Kenneth and Janet Hiles. The bride’s attendants included Jessica Snyder of Chester, South Carolina, Kristin King of Hartsville, South Carolina, Jerilyn Lemon of Latta, South Carolina, Amber Dillon of Pinehurst, North Carolina and Kiara Vera of Buffalo, New York. The groom is the son of David and Robbie O’Neal. He is the grandson of Alvin and Barbara Tarleton and the late William and Elmer O’Neal. His attendants included David O’Neal of Patrick, South Carolina, Travis Snyder, Marcus Snyder, Wally Wilmore and Bentley Wilmore all of Chester, South Carolina. The bride holds a Bachelor of Science degree in Business-Computer Information from Anderson University. She is employed with Chase in Florence, South Carolina. The groom holds a Bachelor of Science degree in Computer Science and Mathematics. He is employed with Chase in Florence. South Carolina. The couple will reside in Florence, South Carolina.